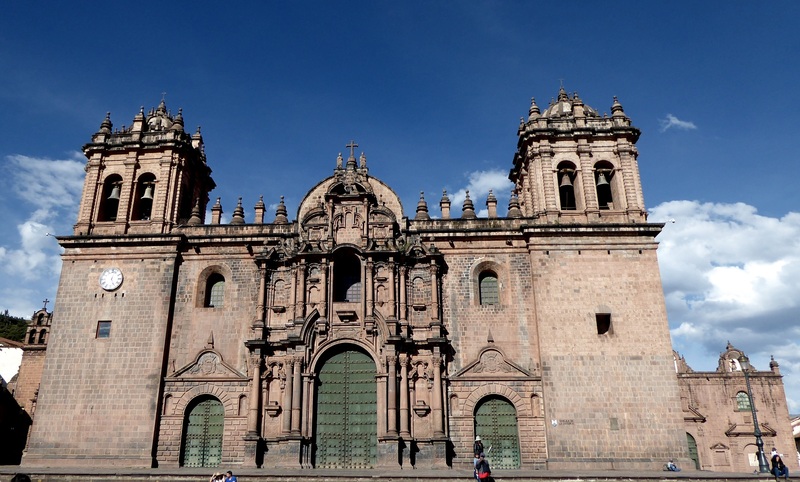 Cuzco (aka: Cusco, Qusqu and Qosqo) was the capital of the Inca Empire from the 13th until the mid-16th century when the Spaniards made their presence known and changed everything. 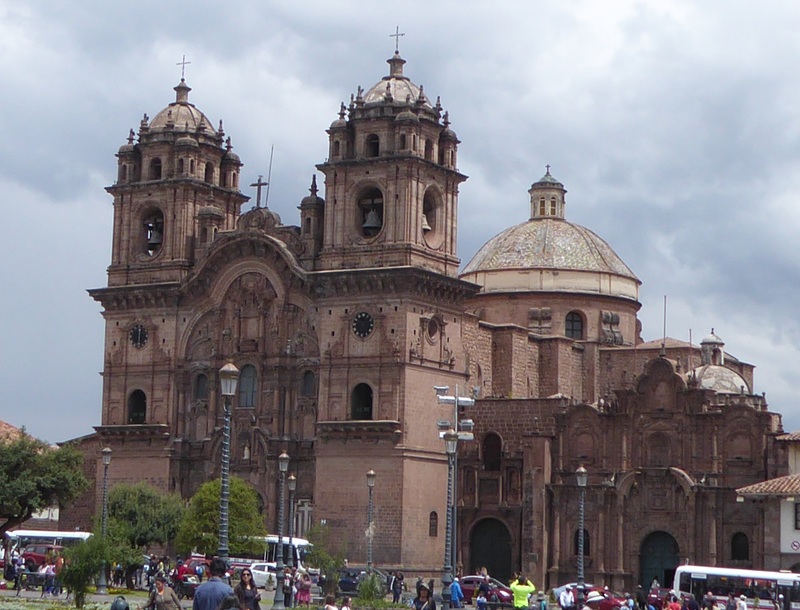 It is now officially designated as the historical capital of Peru. However, the Inca were not the first peoples here. 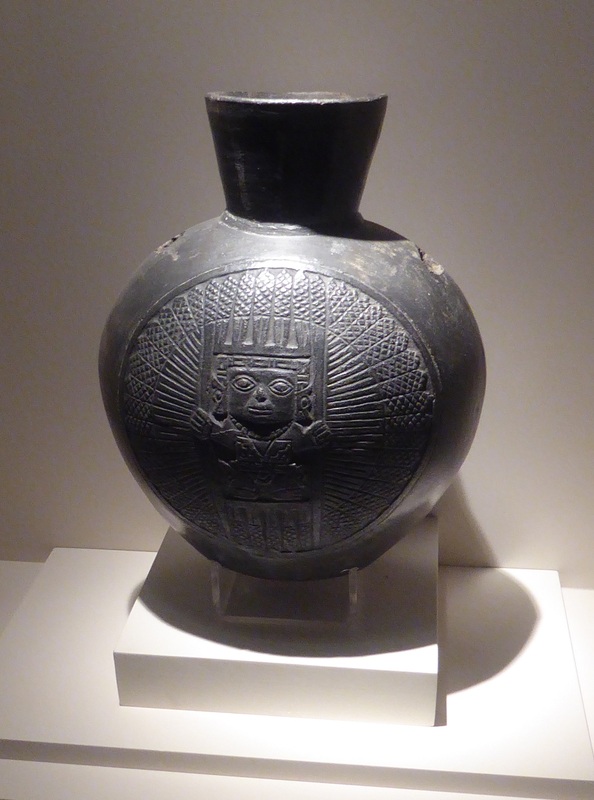 There were quite a number of pre-Incan cultures in the area, but not much is known about them. So, there’s our miniature history lesson. Teeny tiny. 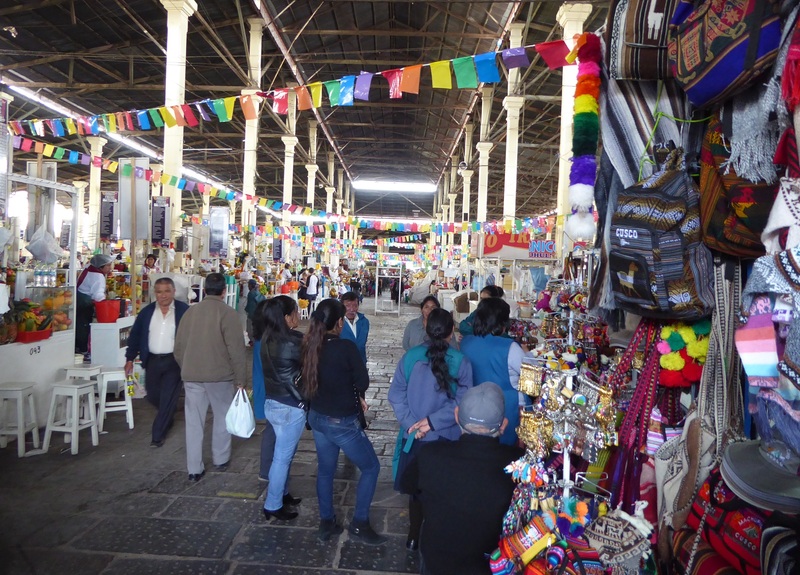 This is the town center – la Plaza de Armas – and here’s pics from my first walk into town. 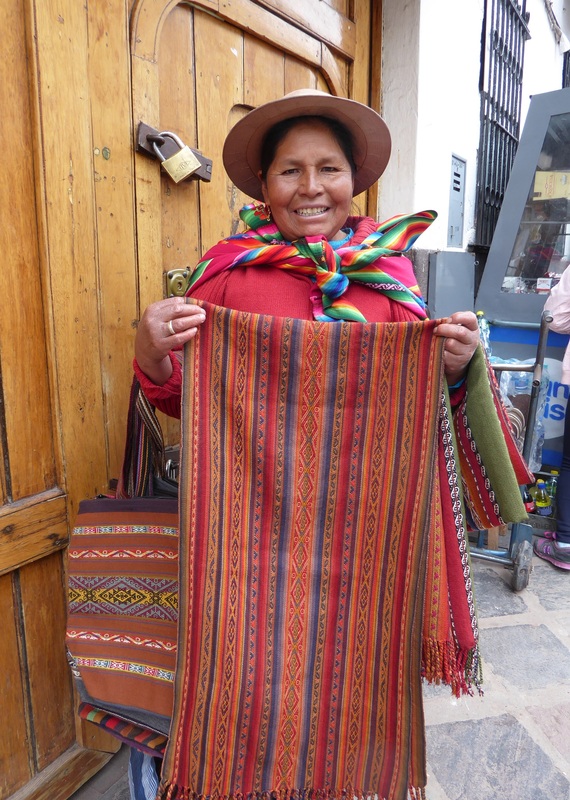 This woman made the beautiful piece of fabric she is holding. There are so many people who approach you all day, every day, trying to sell you something. You have to learn to be firm, say no thank you, and keep moving on. I tried this with her, but she pursued me. I wouldn’t say aggressively, per se. That connotes an offense or an assault. Let’s just say… determinedly. I think she saw the look of desire in my eyes when she showed me this gorgeous piece of fabric and she knew she could break me down! And she certainly did. There are quite a few churches in town. I didn’t go in to many here. I think I’m a bit burnt out on gold leaf, to be honest. But, they’re huge and impressive. If you’re curious as to why I’m tired of gold leaf, I’ll refer you to this post. 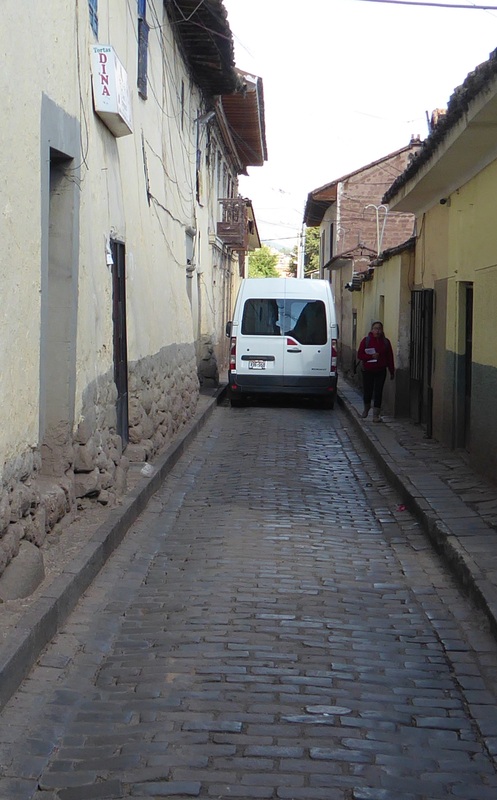 In order to get to town, I walk down a very narrow street. 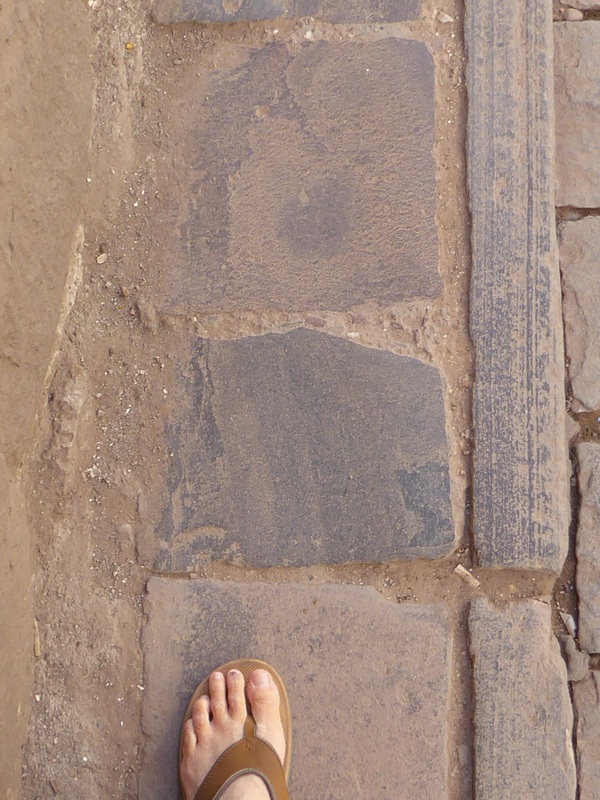 I have my foot in the picture to give you scale. On the left side, the wall is not exactly perpendicular, but it is starting to slope up. 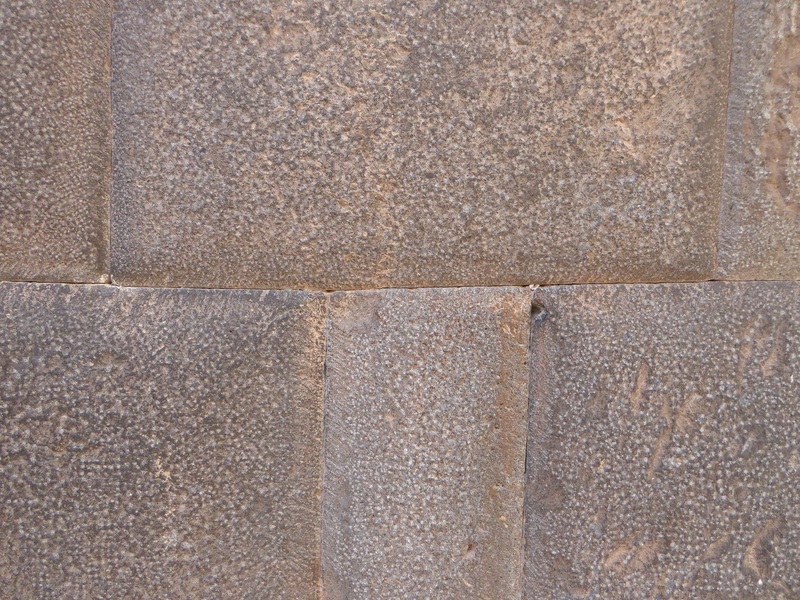 On the right side, the long vertical stones are the edge of the sidewalk. This is about average. As you’ll see in the following pic, the sidewalk gets wider and narrower. But also notice how completely some of the vehicles fill the space! You actually have to watch out for the side mirrors. I think in Peru, in general, cars are definitely king. You watch out for them, not the reverse. Obviously, you should do this anyway, but it seems that pedestrians are nothing but obstacles to drivers. A small alley off that same street at night and day. 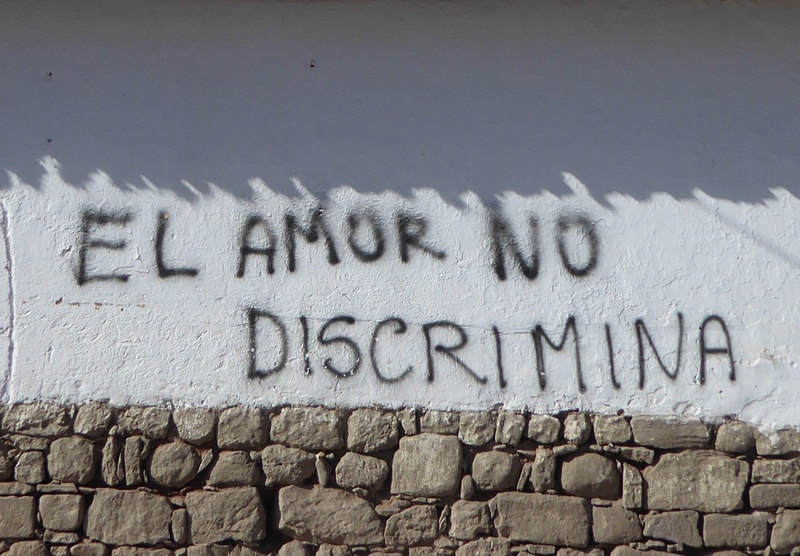 I’m happy to see that Peruvians are speaking out about gay rights and equal rights for women. I was at the main market one day walking around, gaping at everything and I almost walked into a film crew interviewing a woman about gender rights. 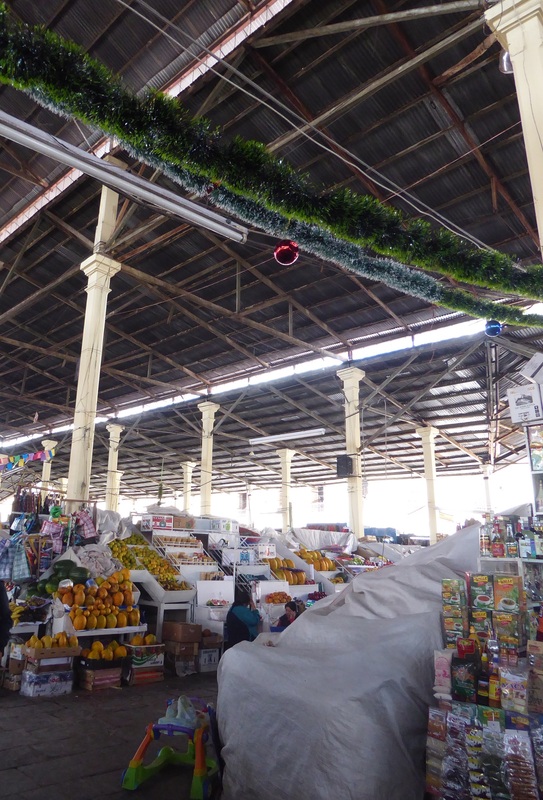 Here’s another pic of the market. Look at the tiny little Christmas tree ball at the top! 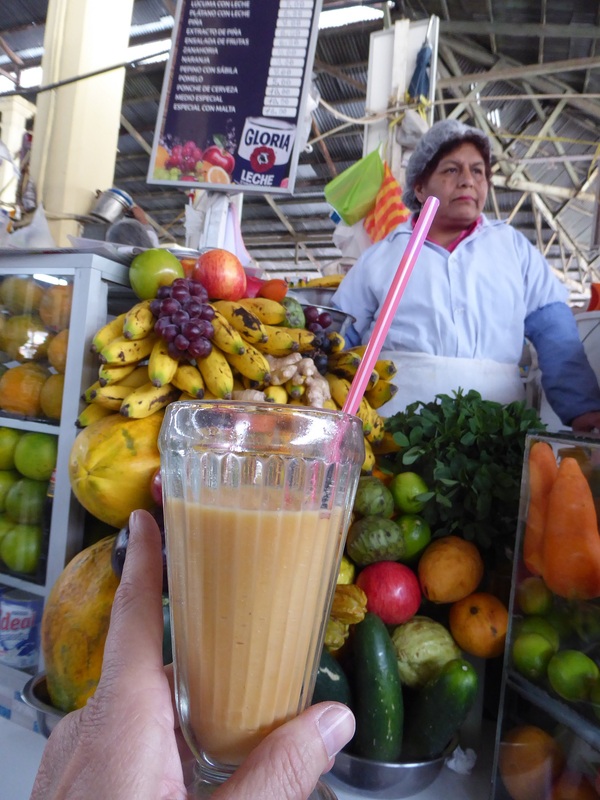 One day I had a fruit shake here and it was delicious. She filled this glass four times! If I remember correctly, it had apple, banana, papaya and pineapple. I’ve been to a few museums here. The first was the Inka museum, but photography wasn’t allowed, unfortunately. If you’re ever here, though, I recommend a visit. Lots of beautiful pottery, ceramics and stonework. 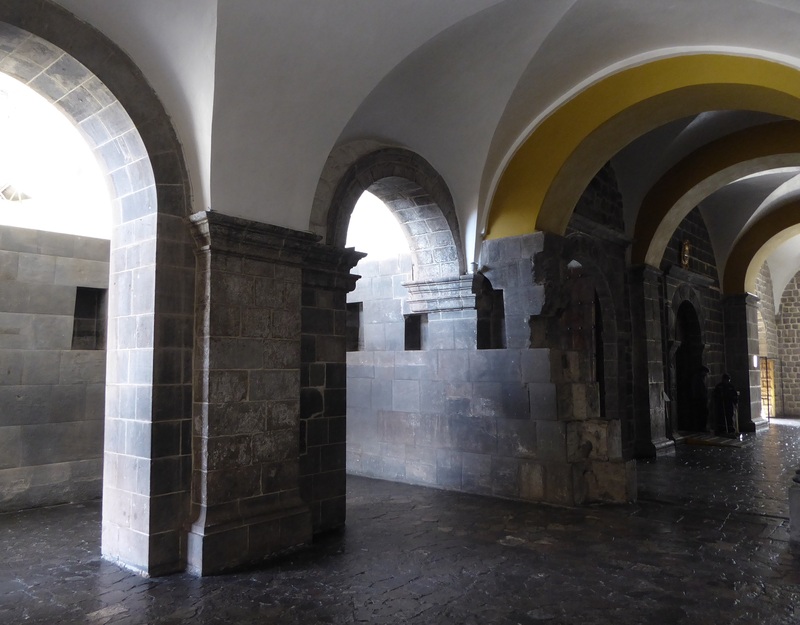 The next museum I visited was the Museo de Arte Precolombino. Here are parts of the collection from earliest to latest. The pieces above and the one below date from 1200 B.C.E. to 1 C.E. 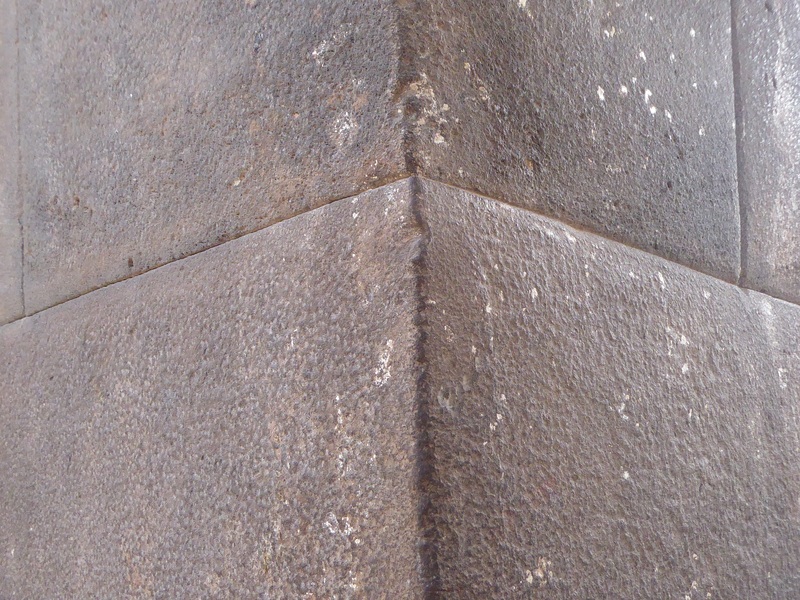 “…3,000 years ago, stone and water combined in a single space. Container and contents in contact; solid stone giving form to something as ethereal as empty space and ever-flowing water pausing to mold itself to the form of carved stone.” Beautiful. The grouping above date from 1 to 800 C.E. The picture of the four pieces that have handles (though, unfortunately a little blurry) are corn toasters. Think Jiffy Pop! 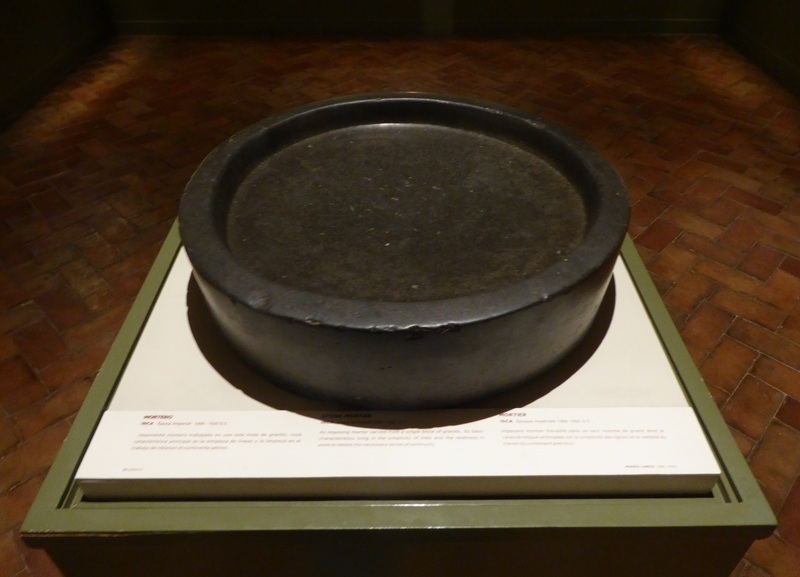 Above and below are pieces dating from 1300 to 1532 C.E. (when the Spaniards showed up). This hand carved stone bowl was not behind glass and I couldn’t keep my hands off it. So smooth and cool and hand carved by an Inca artist! 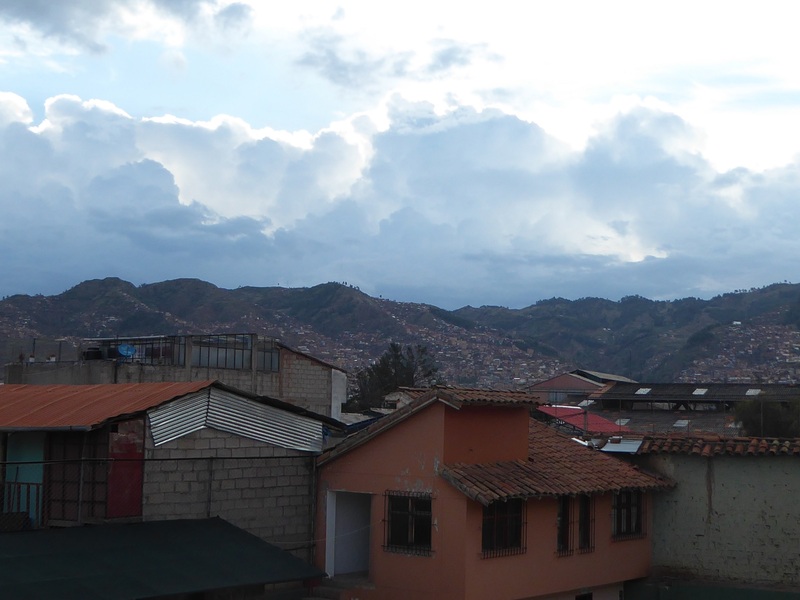 Here are some more views of the town itself, this one from my hostel window. 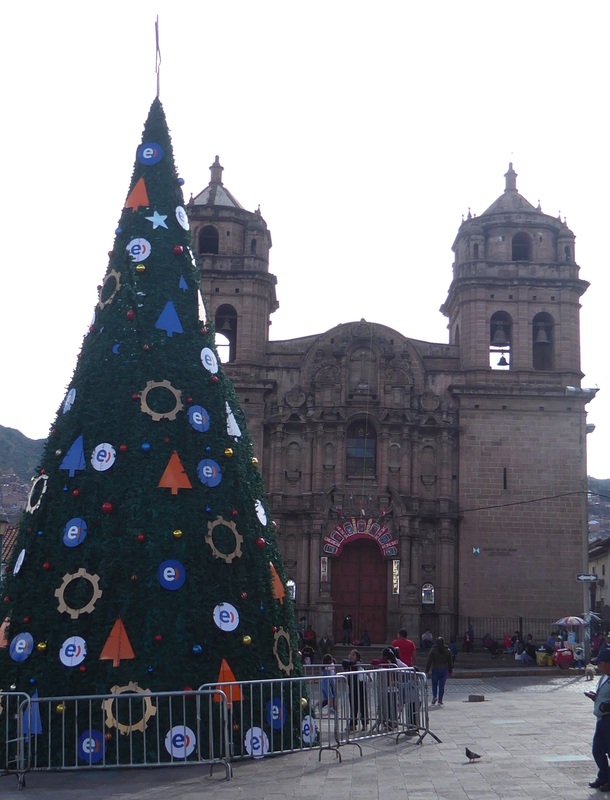 Cuzco is a very touristy town (she said, fully recognizing she’s part of the problem). There are tourists of all ages and cultures here. If there’s any one predominant group of tourists, I’d have to say it’s New Age ‘spirituality seekers,’ for lack of a better term. 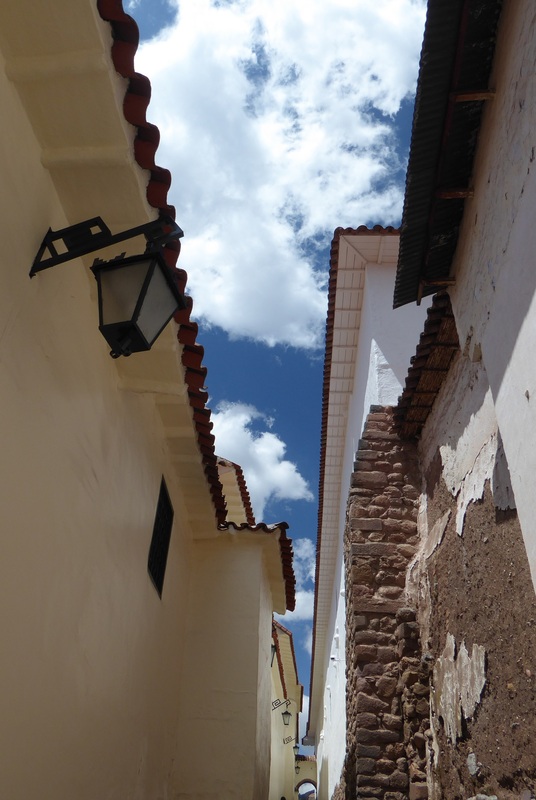 Though I don’t think they’re here so much for the city of Cuzco itself, but for the Sacred Valley area surrounding it, which definitely inspires a sense of awe. I appreciate the effort. I think most people go through a searching period in their lives and kudos to them. I’m not New Age-y, myself. I’m pretty much a science geek and probably always will be. But to be clear, I don’t believe in Science – I appreciate and trust the Scientific Method. It’s an honest effort to understand what is. It’s not my ‘god’ as some suggest. This in no way means I don’t have what you could call a sense of spirituality. I am in awe of what is. I’m in awe of the stars in the night sky. I think the reality of the physics of stars is mind-bogglingly more fascinating and beautiful than anything that can remotely be found in astrology. I’m in awe of the beauty and power of geology and how it shapes our landscapes. I’m in awe of the way a small seed can grow into a Giant Sequoia. That, if we must use the word, is my spirituality. I’ve heard so many people here talking about crystal healing and ‘the gods’ and spirits and actually telling me I need to believe some of this stuff or I’m lacking something. So I guess I needed this little rant. I’m fine. The universe is a wondrous place. Happy to be here. (: Thank you for your patience! I love the way the blue sky almost looks like a jigsaw puzzle piece here. Street food. 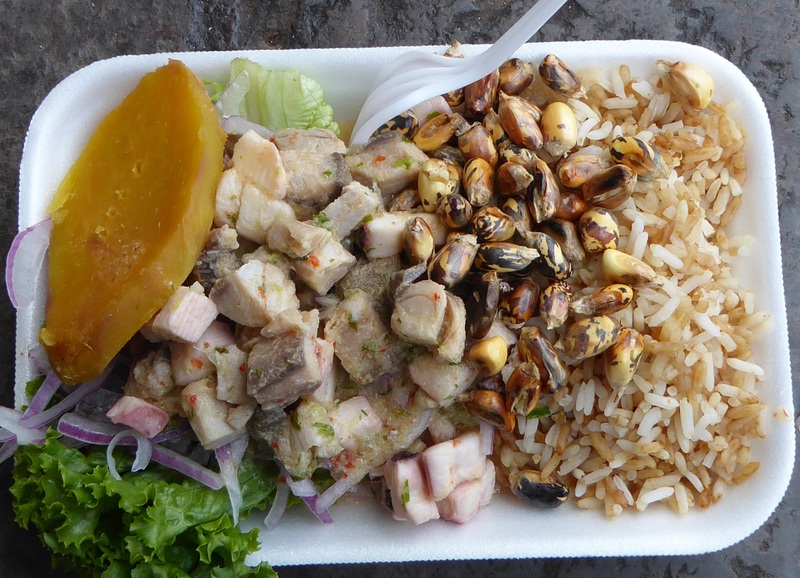 Ceviche. I like it, but I think I might like to try it with shrimp instead of fish some time. But, still tasty. I saw this dead butterfly on the sidewalk and picked it up and carried it to a place out of the wind so I could take these pictures. It was the stunning blue color on the underside of the wing that first caught my attention. But isn’t the black & white side amazing? 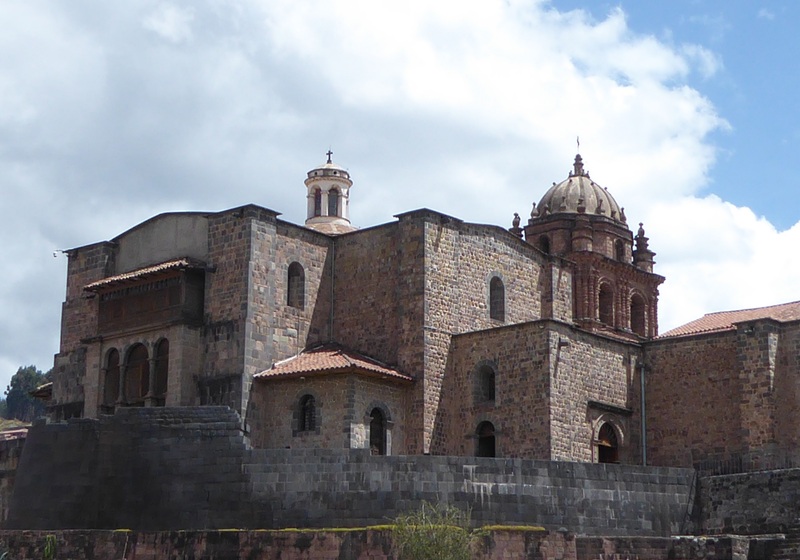 Qoricancha (meaning Gold Enclosure in Quechua). 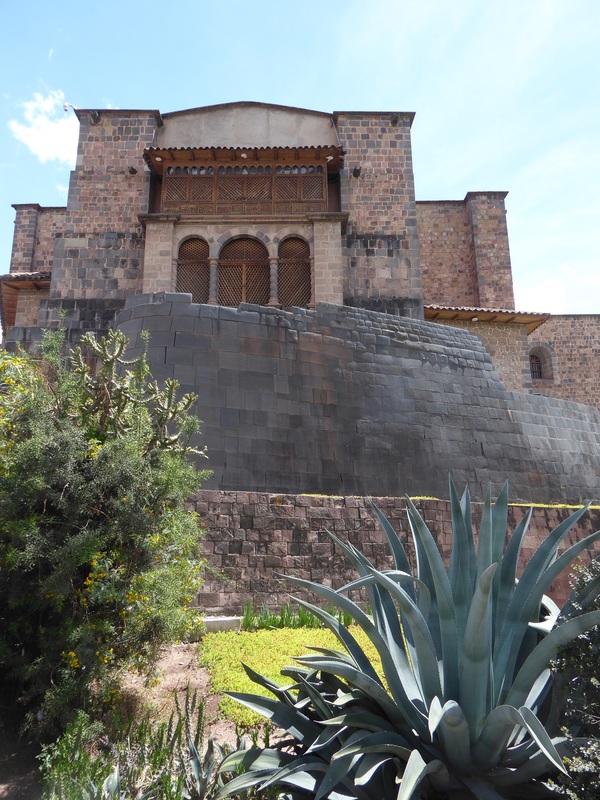 This was the most important temple of the Inca. 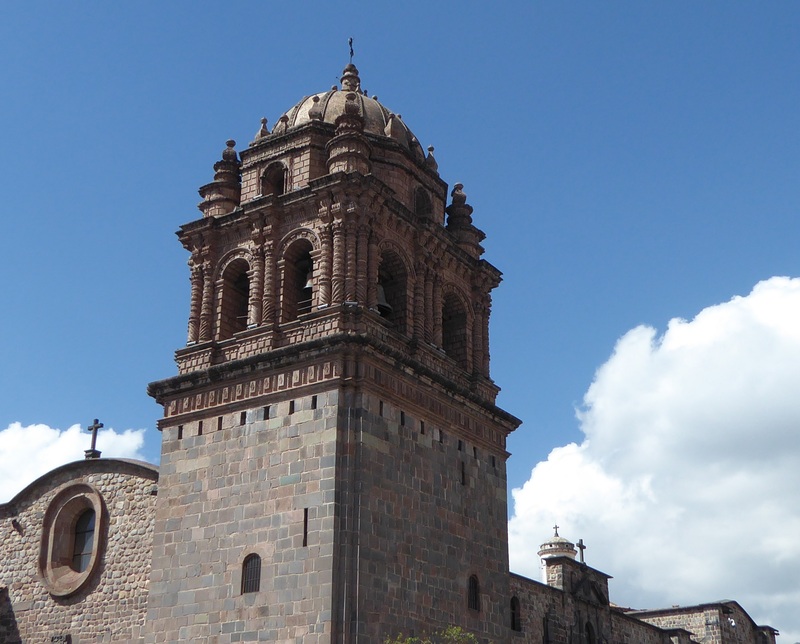 It was largely destroyed by Spanish conquistadors in the 16th century. 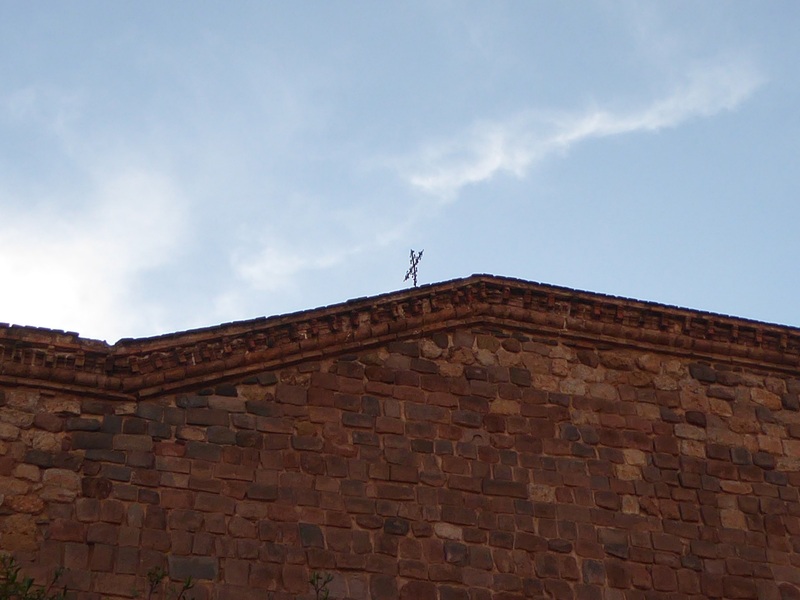 A Catholic church was built atop the remaining foundation. 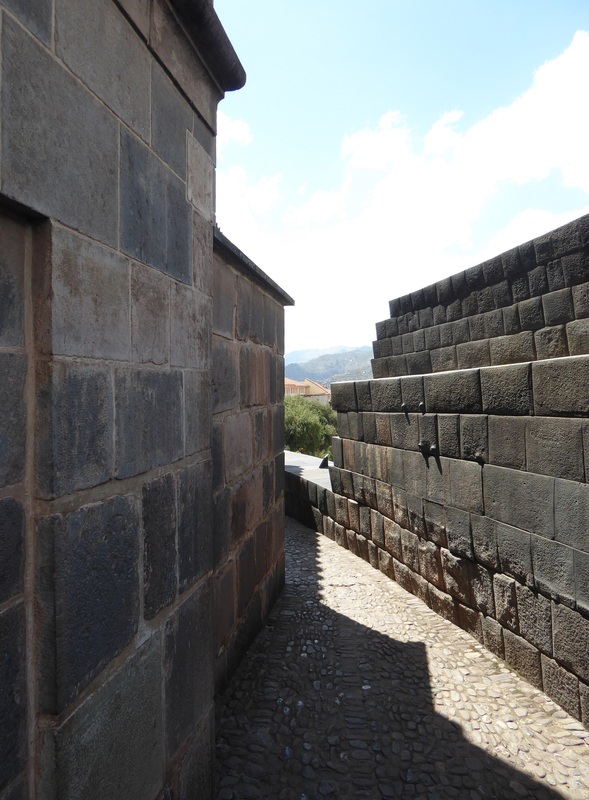 At one time, the inner walls were covered with sheets of gold, hence the name. 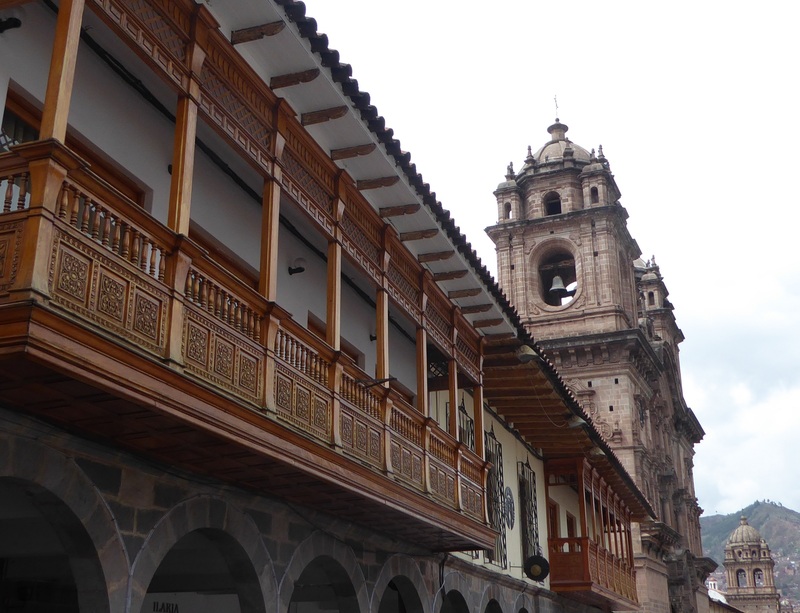 But at a later time, the Spanish required gold as ransom for the life of one of the Inca leaders so most of the gold was removed from the walls. 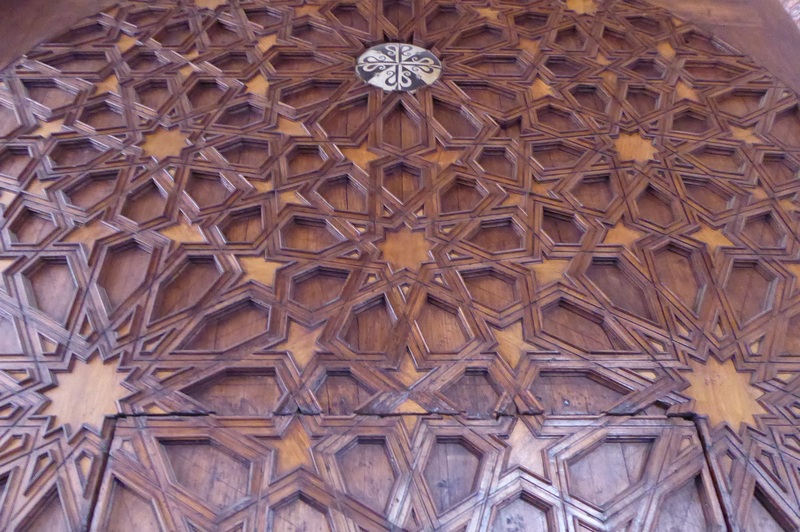 This is part of an entrance door. 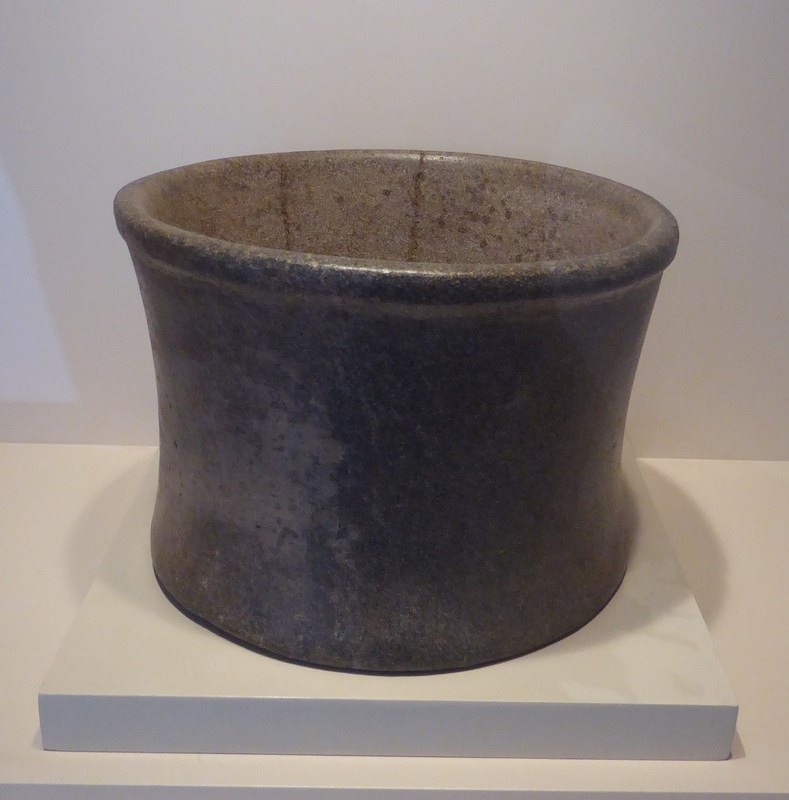 Part of the Inca foundation. Priceless. 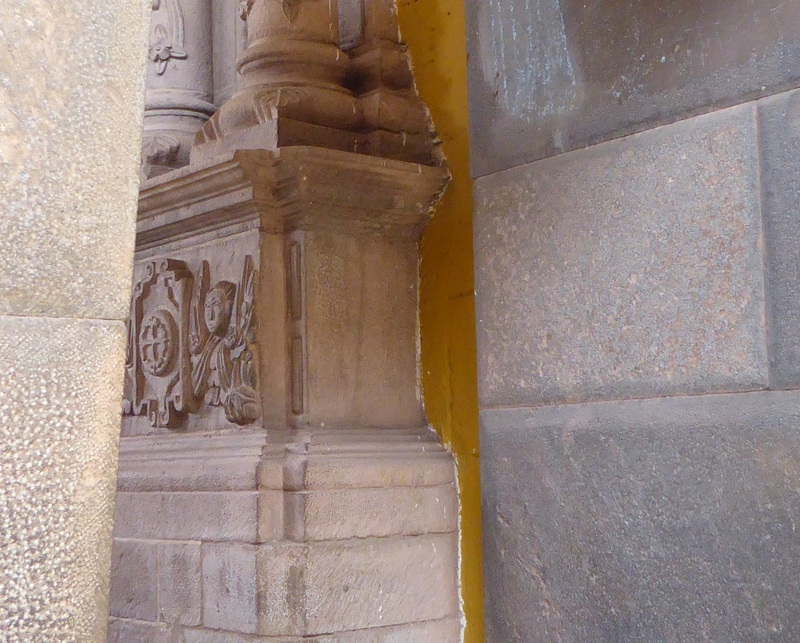 Juxtaposition of Inca and Spanish construction. I think this is a nice view as much for the blue sky and white fluffy clouds as for the courtyard of the church. Connecting pieces. Sort of like a dove-tail joint. 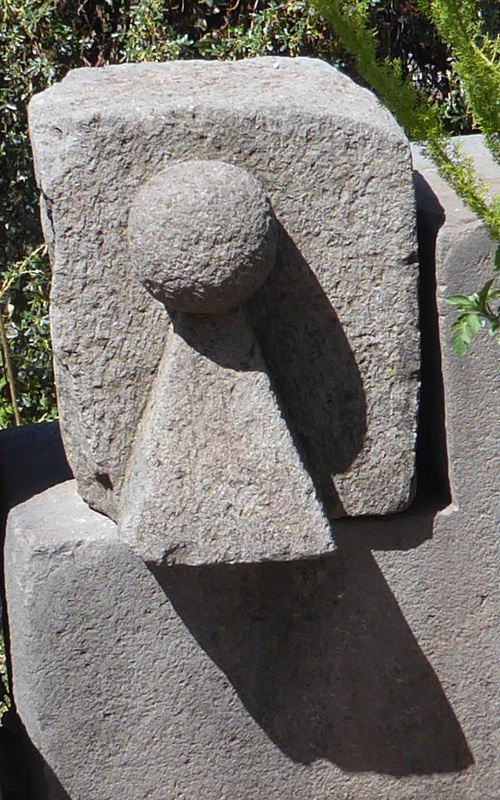 The black stone is andesite, diorite and limestone and, of course, Inca built. Last, but not least. Okay, maybe least. The past few days I’ve been hankering for familiar food. I saw a nearby restaurant named Tex Mex and, being a Californian, that sounded pretty good. Burritos, tacos, enchiladas. All food I love. So I bought a veggie burrito. Good. Very good. It even had a fried banana slice in it which was a surprisingly good compliment. 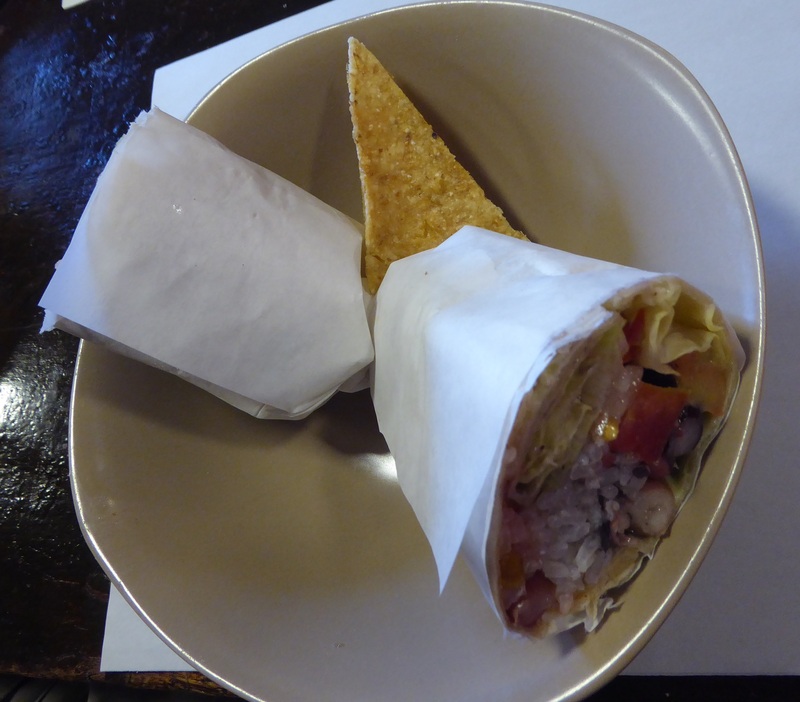 But, and it’s a big but, this burrito has nothing on Duke’s Super Crazy Veggie Burrito with everything on it, which is the best burrito on planet Earth. Chico, here I come. 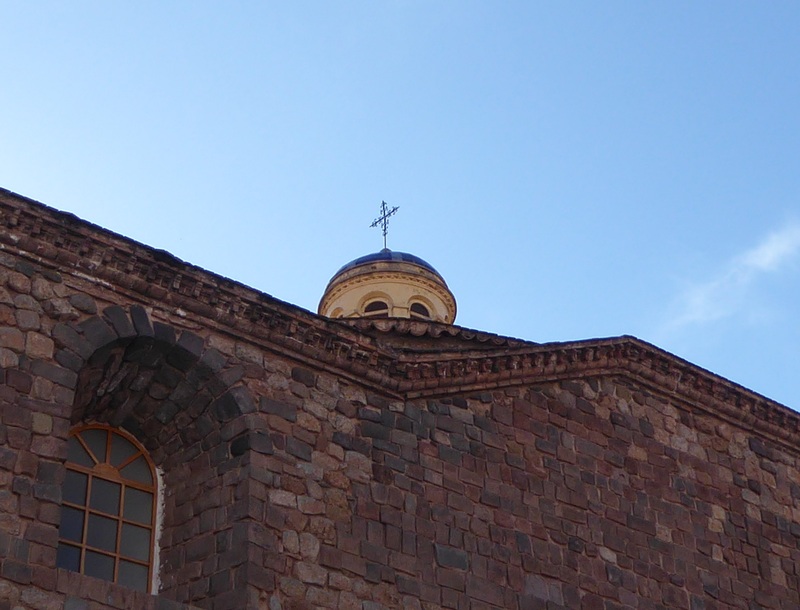 This post about Cuzco is, admittedly, disjointed and all over the map. Or not… but it seems so to me. 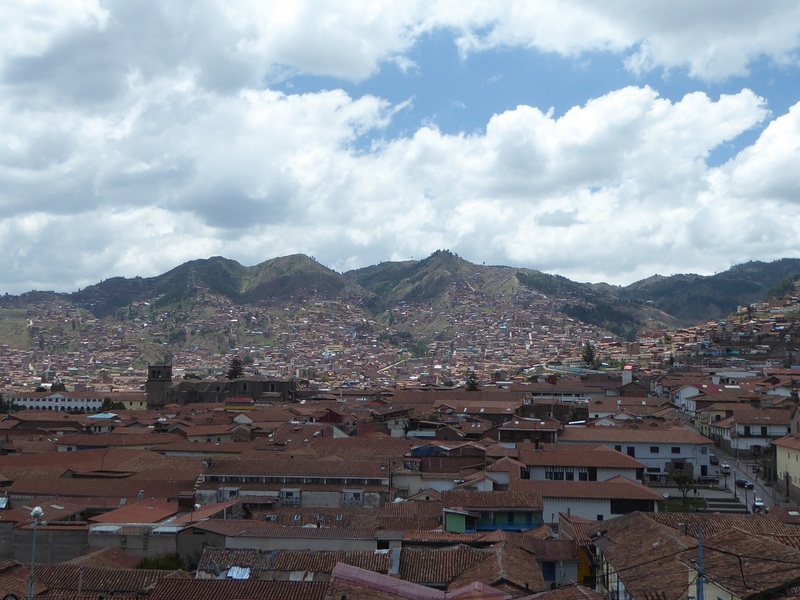 I don’t really have a singular impression of Cuzco. But then, maybe my heart and mind are elsewhere right now. This, my first but hopefully not last, journey in South America is coming to a close soon. I see the end looming and I’m feeling sad. I want to keep traveling. The other side of that coin is that I’m very much looking forward to returning to the States to see my children and grandchildren and friends. I’m incredibly happy about that. I miss my kids terribly. 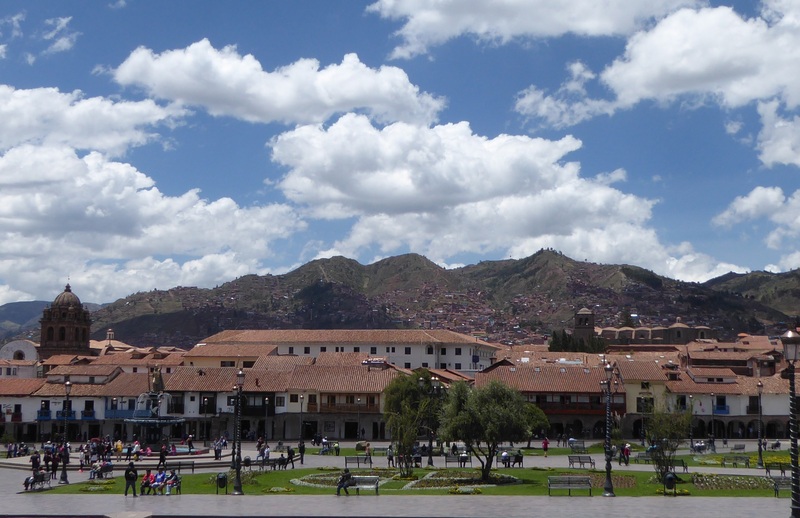 Cuzco is a busy and somewhat hectic city and the people are very friendly. 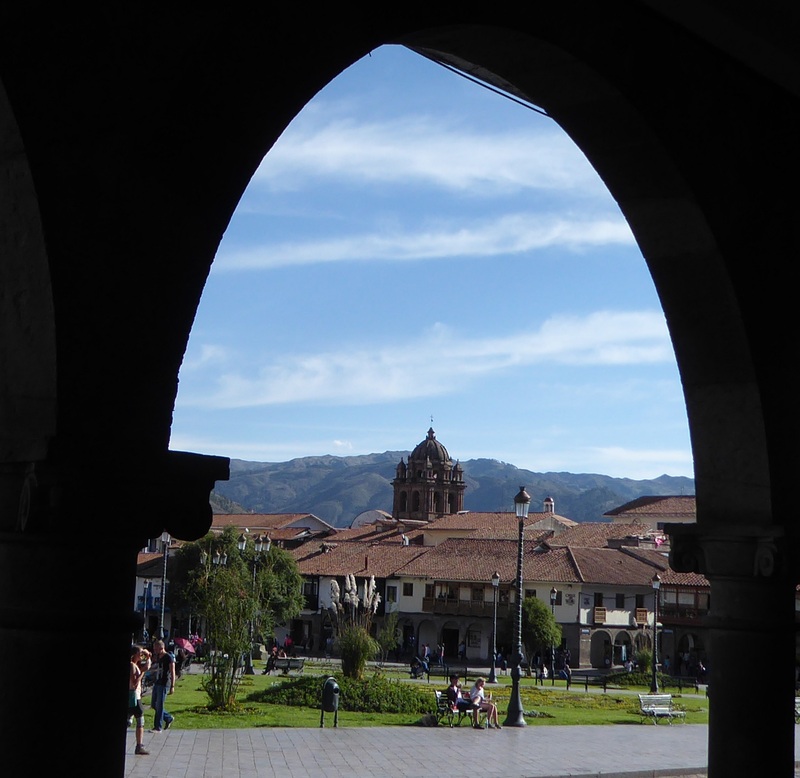 There are areas nearby, such as Pisac, that I’d love to return to. 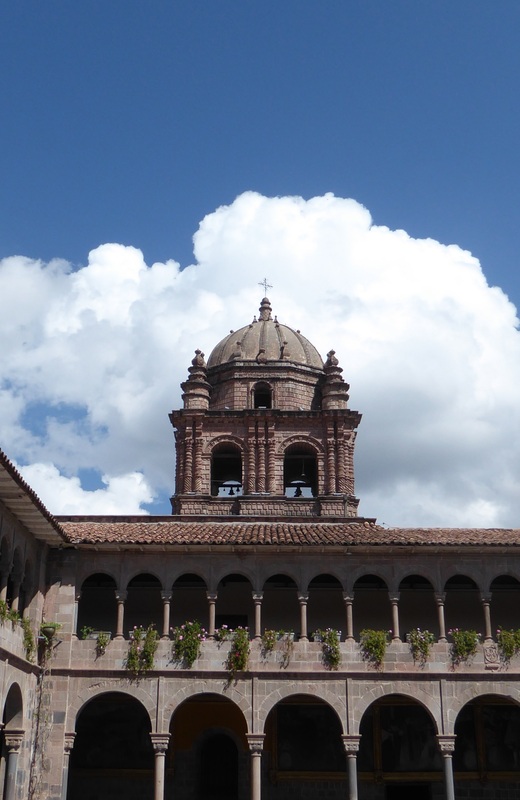 But, I think, for me, one visit to Cuzco is sufficient. Love Latin America. I have a place in rural Panama. I’m going to follow you. Thank you, Jim. I’m honored ….and I’m following you now, too! I do hope to return to South America. I would love to retire here. Hhmmm, let me know if you continue to have problems with it and I will see if there’s anything I can do about it on my end. Thanks for letting me know. From my end, it looks like you got it! Lol. I guess I swing both ways. You’ve been away too long, and Ive not been away long enough. It’s hard to do the Panama blog from Washington. We go back and forth although this trip to Washington has been long. Swing both ways – remind me to take your number! 🙂 Seriously I thought you lived permanently in Panama. Washington ( DC or State?) whichever, it is a great contrast. Lucky kids. The state. Lol. Jackie? I knew it! I started off a bit of a blast at you about the snake and you were kind enough to reply and we debated things. Then I started to follow you and now I have just spent a delightful 50 minutes reading your Blogs on South America. WOW! They are so interesting and great to read. I love them and I love the way you write ! ( No I am not gay , dont worry) I just think you have a great informative and fun way to engage your reader. I have learnt such a lot and its been super. I love South America ( my daughter in law is from Brazil) but I really enjoyed your posts, so out of the negative came a huge positive. Take a Bow! Thanks so much! I’m honored and I really appreciate your comments. I’m glad you wrote and called me on the snake. You were right and I appreciate being made aware of it. I’m traveling to Europe soon and visiting friends in England. Maybe we could meet up for tea! sounds like a plan. I am based down on the south coast, currently living in a caravan whilst my house is ” remodelled” as you Americans would say! Tea WOULD BE GREAT. I’ll definitely be on the south coast. My friends live in Bournemouth. Let’s work out the details….er, in private! I’ll be there some time in October. ….having said that, I realize I have no idea how to get in touch with you privately. My thinking was that I didn’t want to put our plans online for the world to see…. then I remembered the world doesn’t care a hoot about my little blog and who’d be looking anyway? I blame menopause for my rambling mind.